SIlverton/MSS 4/13 - 4/20 - 1st Trip Report - Semi-live!! Discussion in 'Vegas Trip Reports' started by Bonzai, Apr 13, 2018. Thank you everyone for the explanation on the payoff for the bet. For some reason I thought when you took the point spread it was even money. Is the 1.1 standard or does that also vary? Sorry if these are dumb questions but I'm new to sports betting. Obviously I'm just doing it for fun but I like to understand what's happening! Yeah the -110 is standard. You will see it move to -115 or -105 based on how heavily the casino is receiving bets on one particular side. Headed to Southpoint to watch the Celtics. We both did not do well on VP there. 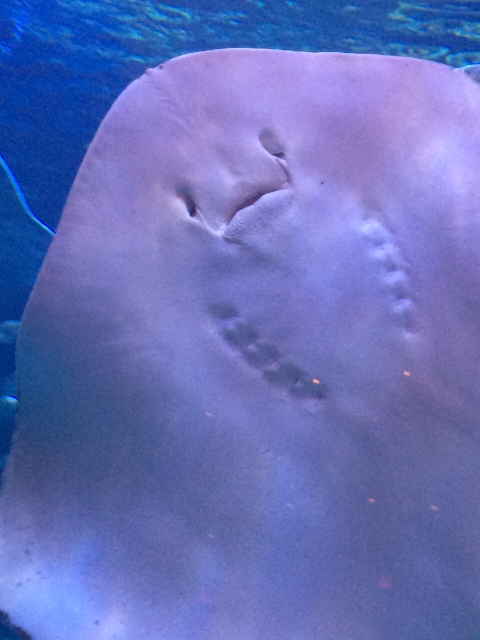 Back to Silverton and saw them feeding the stingrays. I went back to Southpoint to play in the 6pm tourney. Got there a bit early and played 1/2 NL. Made a $250 profit. Did not cash in tourney. Had no premium hands the whole time and just couldn't get much going. Plus I was exhausted from being up since 2:30 am! My luck has gotten better this morning with some decent hits. I had to make a quick return trip to Southpoint this morning as I had a $50 TITO I had forgot to cash in! We met with a host this morning. She was super nice. She reviewed our play and comped all charges - 2 room night plus resort fee and one buffet we charged to the room. So with food coupons we had we did not pay for any food here, just tips. The Sundance grill is excellent and we'd highly recommend it. We are checking out soon and heading to MSS for the next 4 nights. Really looking forward to being downtown! Doing my best to keep up with the report. I'm sure I'm forgetting some stuff but I'll try to do a recap once we are home! Nice stuff so far! Good luck the rest of the way! 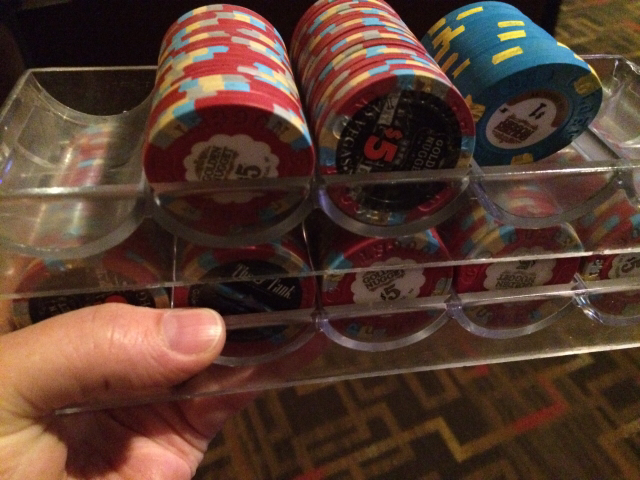 Quick post - just made $508 profit playing 1/2 NL at the golden nugget! 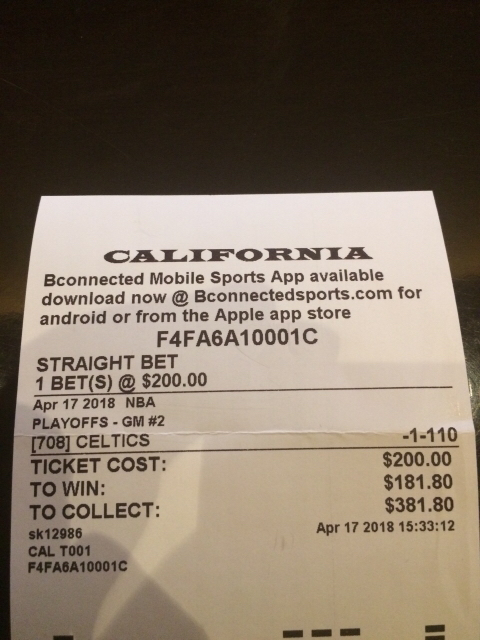 Plan is to bet a good part of my profits on the Celtics, and hang out At the California sports book for the game. Great vp at MSS...and also good vp at Cali. You can do better than that 8/5 DDB schedule. Right by the escalator to the Cali-MSS bridge you will find 9/6 DDB STP...even better payout than 9/6 DDB and oh so crack-addicting! Our move to MSS on Monday 4/16 was not as smooth as usual. Tried to checkin about 11. No connecting rooms ready yet but they blocked them off for us. We had a bunch of stuff in the car we wanted to put in the fridge. So we played at the boar bar for a while and walked on Fremont a bit. It was great to visit "my machine". This is a 3/5 play along the wall next to the bar and my favorite place to play. Room was finally ready about 3:30 so we got settled in the room and returned the rental. I played in the 7pm golden nugget tourney but did not cash. Another down day for my bankroll. Tuesday we ate at the MSS breakfast buffet. It was good to hear Mannys distinctive voice and the food was good as usual. We did a coupon run to Downtown Grand, el Cortez, and four queens. Also stopped at the Vue bar at the D. No big wins but was a good way to kill some time. Then I headed to the GN poker room for some 1/2. Finally had some luck there and cashed for +500. Bet $200 in the Celtics. We ate at the MSS buffet for dinner. It was prime rib and scampi night. I think it used to be strip steak not prime rib. Everything was excellent especially the prime rib and desserts. Then I watched the Celtics at the California and was very happy with the outcome. Cashed my ticket and back to GN for poker. I was exhausted so didn't play long but did cash out +250. Headed back to the room and crashed. Yesterday was my first positive day for the bankroll, up a little over $600! Finally! Not sure what is in store for today. I think we will use the ACG coupon for the plaza slot tourney and see where the day goes from there! Had a few close royal calls. This was one of those sessions where I was in the zone. Got dealt the SF for the progressive. Hit a bunch of 4osks. Didn't take pics of all. At one point, K and I hit 4oaks at almost the same time but his was first for an extra .15! As soon as the progressive hit 1200 I cashed out. Headed to White Castle since I have only had a donut to eat today! I think this is my drunk day. Yes I got dealt 4As with kicker!!!!! Definitely my day. After some yummy White Castle burgers we went to DG. The 4 As progressive was about 1100. No I didn't hit it. But I went and played craps and cashed out +250! Guy next to K hit the progressive. 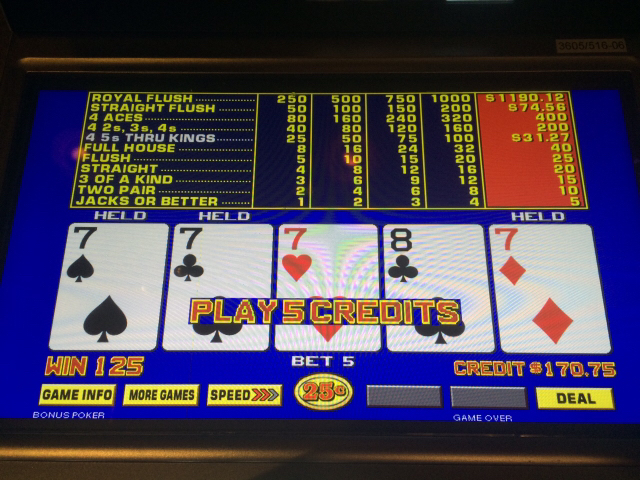 Then while I went to the bathroom K put $6 into a $1 slot machine and hit for $200!!! I love the View Bar at the D. Usually spend many hours there. Nice dealt Str8 flush. Can't wait to be back there in 36 days. Hope the luck continues. Wow. I wish I was there. Apparently the Vue bar is my lucky place. Went back this morning but figured I wouldn't hit anything after my awesome run yesterday. I was wrong. My first $20 went pretty quickly but decided to try another. Playing the DDB progressive which I know is only 8/5 but the BP one was about 1250 and I'm not interested in a W2-G for that amount. Ended up catching these within a few hands of each other. Cashed out for $700. So I'm the past 2 days I am +$1100 at the Vue bar and have a shot at going home either up or close to even for the trip as long as Oleg stops bringing me beers at the Boar bar! Oleg NEVER stops bringing it. Believe me. Just did the SW checkin which means our trip is on the last 24 hours. We got B54/55. Hopefully I can just pass out on the flight! Plan is try the WAX bus for the first time. Taking the 1:54 for our 4:25 flight but no bags to check. Should be plenty of time. 4 Pale Ales in about 45 minutes!!!!! You are on fire! Nice wins! Nice run! Hope you enjoyed the rest of the trip!